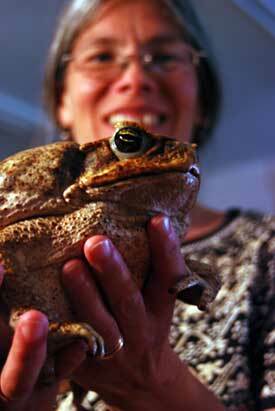 Toad research could leapfrog to new muscle model: "Science has long held that muscles behave largely like motors. Northern Arizona University researcher Kiisa Nishikawa suggests that muscle acts more like a spring. 'Existing theories don't explain how muscles shorten rapidly,' Nishikawa said. 'Muscles can only shorten to do work; they can't do work by lengthening.' A spring also can only do work by shortening." "...At ASU's Human Machine Integration Laboratory, Sugar and his team are building 'SPARKy' (Spring Ankle with Regenerative Kinetics) that mimics biology by storing and releasing energy during the ankle gait cycle. 'Energy is stored as the leg and body rolls over the ankle, and then this energy is released in a powerful burst to propel the user forward. By mimicking biology, we are able to build a very lightweight and functional device,' Sugar said. 'Putting motors and springs together in a smart way is something nature hit on about 600 million years ago (with the earliest vertebrates),' Nishikawa said."